On the hunt for a new Easter tradition? Cascarones (derived from the Spanish word cascara or "shell") are a cross between an Easter egg and a piñata. A key part of the celebration at Fiesta San Antonio and other parades and carnivals in South Texas and Mexico during the Lenten season, H-E-B has all the supplies, kits, and ready-made cascarone eggs you need to bring the tradition home with you. While many Americans have grown accustomed to dyeing and hiding hard-boiled eggs at Easter, cascarones don't require any time in a bubbling bath and are straightforward to make at home with your family. Simply cut a hole at the base of the egg with a small knife or nail (this is a job for mom and dad!) and let the yolk and egg white drain out. Rinse the inside of the egg under the tap and then let eggs dry by placing them hole-side down on a rack. Using traditional Easter egg dye from H-E-B, color your eggs in your favorite rainbow shades. But don't feel confined to keep your creations inside the box. 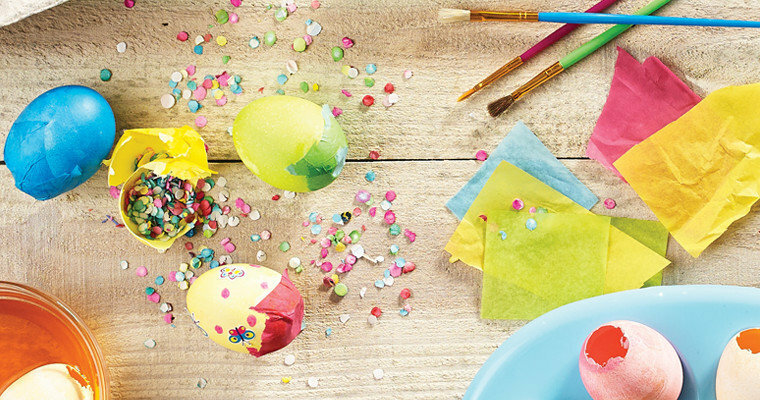 While cascarones are more fragile than traditional Easter eggs, you can still use fun techniques like crayons, markers, or make designer eggs. After the shells are dry, use a small spoon or funnel to fill them with confetti. You can either opt for store-bought bits (which can be found in the seasonal section of your local H-E-B) or have kids cut up small pieces of colorful paper. Historically, cascarones were sealed shut with wax, but today, tissue paper is an easy and quick solution to hold in the confetti. Apply glue around the opening and seal with tissue paper. Finish by touching up your design around the closing. 5. Crack Over a Friend's Head! The cascaron—a shell filled with confetti and dyed or decorated like a traditional Easter egg—is said to bring good fortune when cracked over a person's head. This tried-and-true Tex-Mex tradition traces its roots back to Asia, where eggs were traditionally filled with perfumed powder or ash and given as gifts. From Asia, Marco Polo brought the sweet-smelling shells to Italy, Spain, France and the rest of Europe where young men and women signaled interest and attraction by throwing them at one another. "Fiesta San Antonio has our opening ceremonies at the Alamo," said Director of Communications and Consumer Marketing Shannon Houghtaling. "Once we conduct the formalities, a cascaron is cracked on a head, and that means Fiesta has officially begun." Around the 1860s the French Emperor Maximillian's wife Carlotta found such an air of intrigue with cascarones that she introduced them to Mexico. It was here that the perfumed powder was swapped for confetti, and the new world began using cascarones in their modern form. Eventually, the custom fell out of favor, until it was revived in Texas and other parts of the southwest in the 1960s and it remains part of Texana culture to this day. H-E-B is stocked with options to help you celebrate the Easter season in true cascarones fashion. Ready-made cascarone eggs pack all the fun without the fuss and they are sold by the dozen at your local store. If you want to make cascarones, the "just add eggs" kits at H-E-B come complete with confetti, tissue paper, glue, and even decorative stickers. To liven up your colorful creations, remember to pick up egg dye to make DIY a breeze. For true creative license, H-E-B carries all the individual components and supplies to create cascarones that are all your own. Use glitter in place of confetti, try monochromatic eggs with red shells and red confetti, or simply use a highly pigmented dye so that your cascarones stand out among the rest. After all, there's more to this festive spin on the Easter egg than meets the eye.